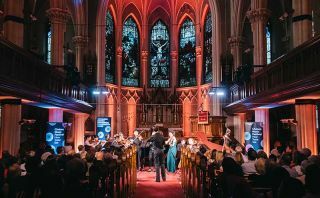 The Chelsea Music Festival has prided itself on the diversity of its programming as well as the spaces in which those performances take place. In its first eight seasons, it has presented events at more than 50 locations throughout Chelsea and the rest of Manhattan, from schools, to parks, to churches. Featuring musical styles running the gamut from classical to jazz, as well as visual and culinary experiences to complement them, its crowd mirrors the diversity of its programming. Anderson Audio New York was on hand to capture the performances of the Chelsea Music Festival at St. Paul’s German Lutheran Church in Sennheiser’s AMBEO 3D audio. This year’s festival, which took place in June, utilized St. Paul’s German Lutheran Church as the marquee location for its opening and closing weekend performances. Built in 1884-85 in the Romanesque Revivalist style, it is not only notable for its appearance but also for the acoustics of its main chapel. For the first time, live recording experts Jim Anderson and Ulrike Schwarz of Anderson Audio New York were on hand to capture every note performed there during the festival for delivery via Sennheiser’s AMBEO 3D audio format. A pair of Sennheiser MKH 8020 were mounted to an A/B bar to handle all primary pickup of instruments on stage. Anderson and Schwarz had also recently experienced Sennheiser’s AMBEO 3D immersive audio format in a demonstration at Sennheiser’s pop-up store in SoHo, and realized the potential for a unique recording of a live performance using the cutting-edge format. It was not long before they contacted Sennheiser and with the German audio innovator onboard as a festival sponsor, worked together on selecting the right microphones to capture every nuance of each performance. Anderson and Schwarz’s miking solution consisted of 10 fixed microphones suspended from wires stretched across the chapel. These included four MKH 800 TWIN microphones suspended above the main seating area above balcony level in a square. A pair of MKH 800 mics and a pair of MKHC 8020 omnidirectional capsules connected to MZE 8120 extension tubes constituted a second, lower square, suspended just below balcony level. “Together they create the AMBEO Cube,” Anderson said. A pair of MKH 8020 microphones were mounted on an A/B bar above the audience at front, facing the stage directly. The MKH 800 TWIN microphones offer versatility for AMBEO 3D recording applications due to their dual independent capsule design: each of the MKH 800 TWIN’s back-to-back capsules has its own audio output, enabling users to conveniently set and modify the microphone’s polar pattern on the mixing desk, either in the recording process or during post production. Also, equalization can be applied separately to the front and rear of the pickup area to correct room imbalances. “Having that kind of flexibility in the mix stage is very exciting,” Schwarz said. Anderson Audio New York’s recording setup was only equipped to handle 24 channels this year, so building their entire AMBEO cube with eight MKH 800 TWIN mics was not feasible while accommodating their other miking needs, but they were able to turn to other Sennheiser microphones to round out their sound, including a longstanding favorite, the original MKH 800. For the lower rear pair, line-of-sight concerns were paramount due to video cameras positioned on the rear balcony, which led Anderson and Schwarz to turn to a pair of Sennheiser’s MKHC 8020 microphone heads suspended from MZE 8120 extension tubes for a compact, omnidirectional solution with deep low-end extension down to 10Hz. A pair of MKH 8020 microphones constituted their main A/B pair and provided stereo capture of anything the festival put in front of them, which will allow them to enhance the focal point of the audio recording during their AMBEO mixdown as needed. “We’ve had string quartets, piano trios, jazz combos, and we’ve really been able to cover them all quite well with only the occasional spot mic needed if the staging was going very far back,” Anderson said. “We even had a piano quintet,” Schwarz added. Those individual spot microphones included a Sennheiser MKH 8040 cardioid microphone and the active tube system of the MKH 8000 series, which saw use as a freestanding drum overhead during select programs.